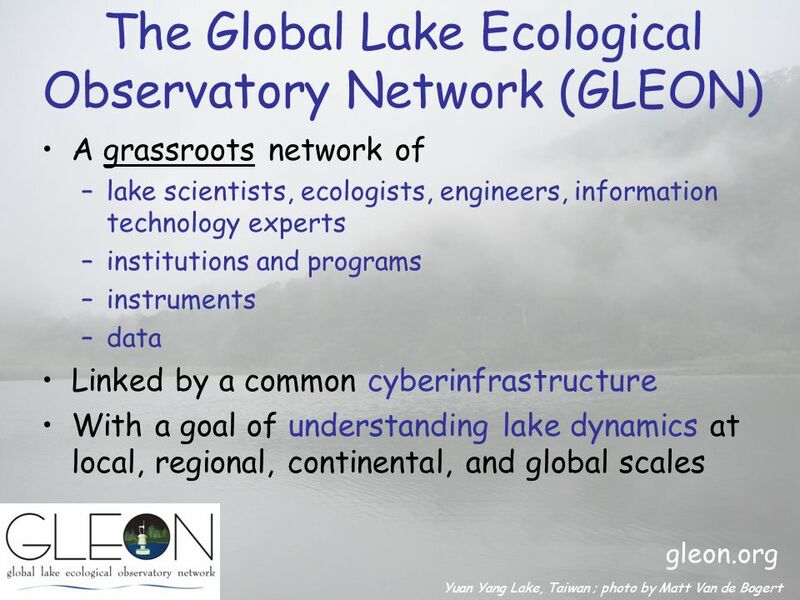 The Global Lake Ecological Observatory Network (GLEON) A grassroots network of –lake scientists, ecologists, engineers, information technology experts. 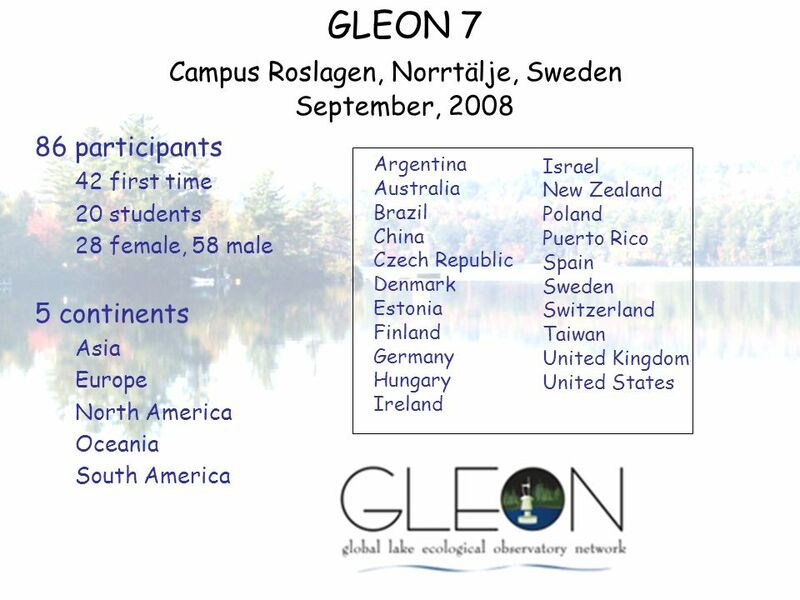 11 How do I become a member of GLEON? 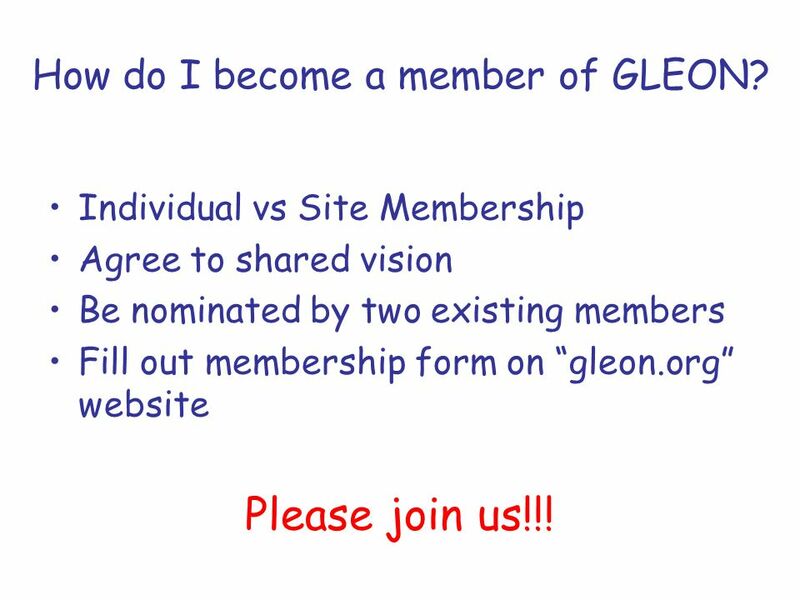 Individual vs Site Membership Agree to shared vision Be nominated by two existing members Fill out membership form on gleon.org website Please join us!!! 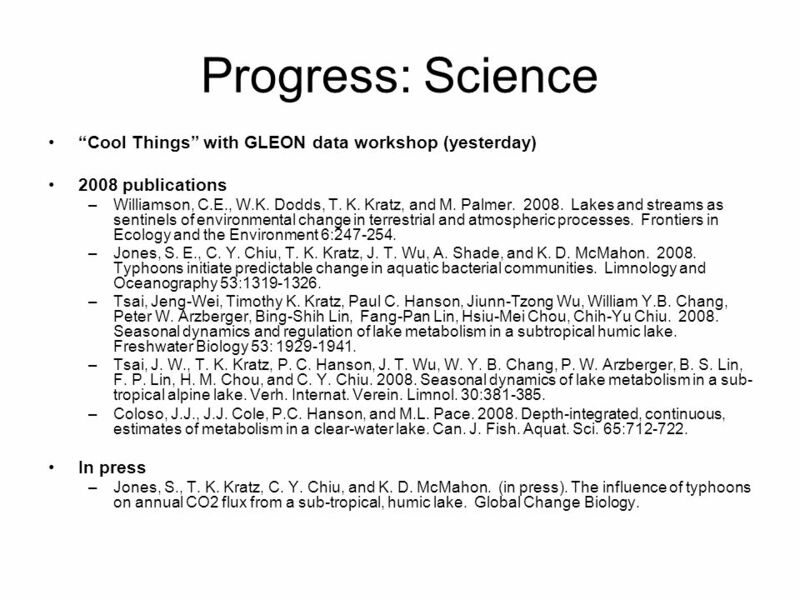 13 Progress: Science Cool Things with GLEON data workshop (yesterday) 2008 publications –Williamson, C.E., W.K. Dodds, T. K. Kratz, and M. Palmer. 2008. Lakes and streams as sentinels of environmental change in terrestrial and atmospheric processes. Frontiers in Ecology and the Environment 6:247-254. –Jones, S. E., C. Y. Chiu, T. K. Kratz, J. T. Wu, A. Shade, and K. D. McMahon. 2008. Typhoons initiate predictable change in aquatic bacterial communities. 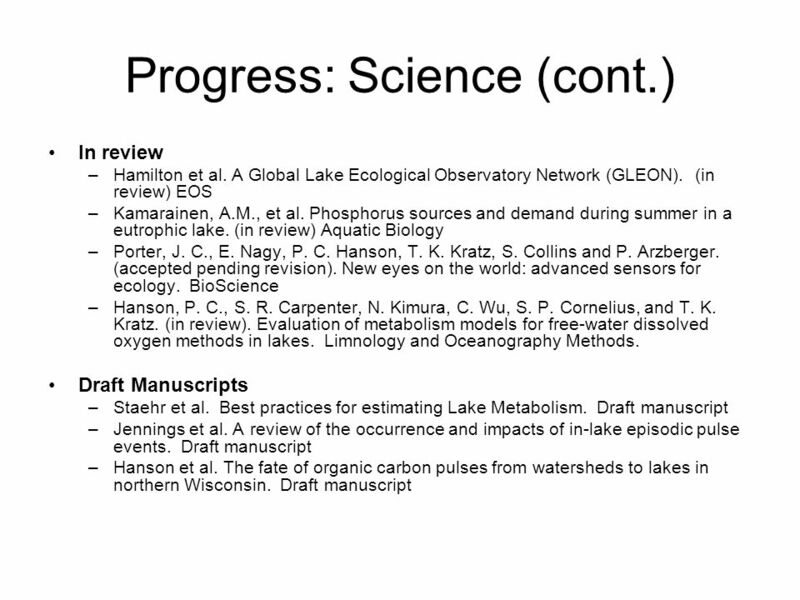 Limnology and Oceanography 53:1319-1326. –Tsai, Jeng-Wei, Timothy K. Kratz, Paul C. Hanson, Jiunn-Tzong Wu, William Y.B. Chang, Peter W. Arzberger, Bing-Shih Lin, Fang-Pan Lin, Hsiu-Mei Chou, Chih-Yu Chiu. 2008. Seasonal dynamics and regulation of lake metabolism in a subtropical humic lake. Freshwater Biology 53: 1929-1941. –Tsai, J. W., T. K. Kratz, P. C. Hanson, J. T. Wu, W. Y. B. Chang, P. W. Arzberger, B. S. Lin, F. P. Lin, H. M. Chou, and C. Y. Chiu. 2008. Seasonal dynamics of lake metabolism in a sub- tropical alpine lake. Verh. Internat. Verein. Limnol. 30:381-385. –Coloso, J.J., J.J. Cole, P.C. Hanson, and M.L. Pace. 2008. 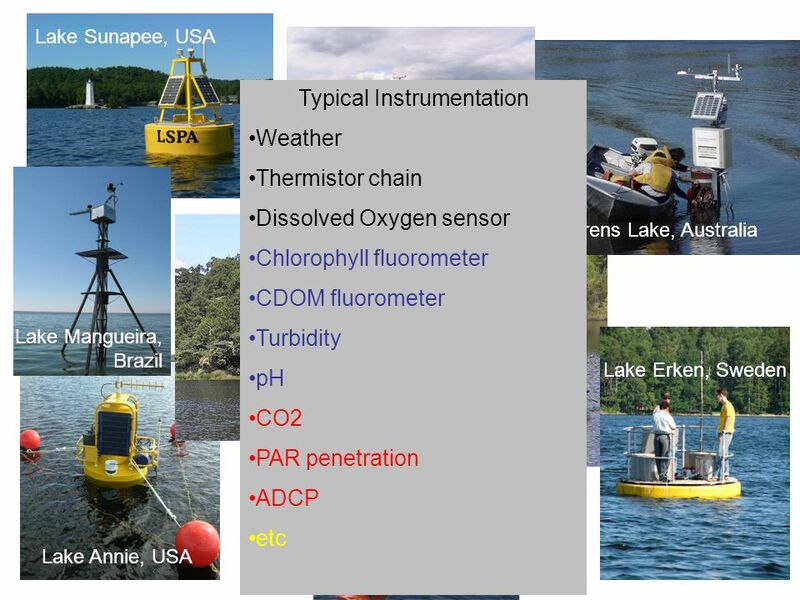 Depth-integrated, continuous, estimates of metabolism in a clear-water lake. Can. J. Fish. Aquat. Sci. 65:712-722. 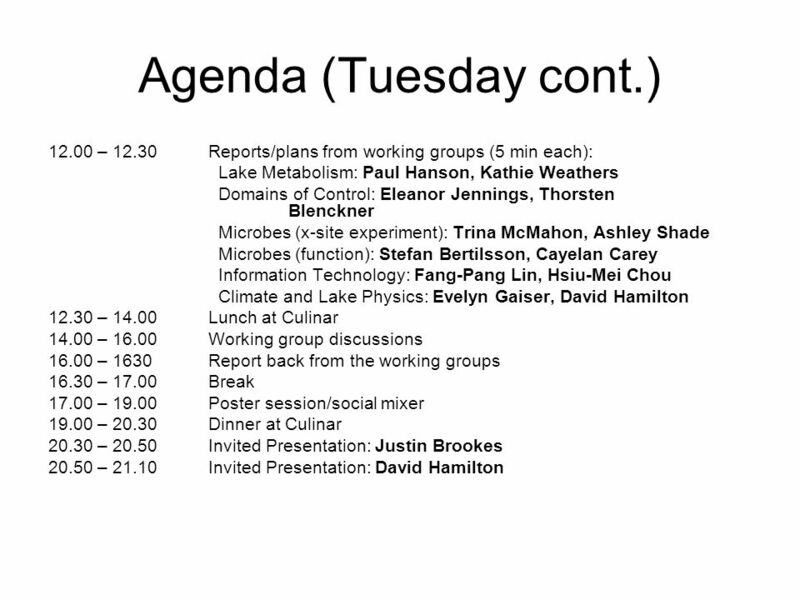 In press –Jones, S., T. K. Kratz, C. Y. Chiu, and K. D. McMahon. (in press). The influence of typhoons on annual CO2 flux from a sub-tropical, humic lake. Global Change Biology. 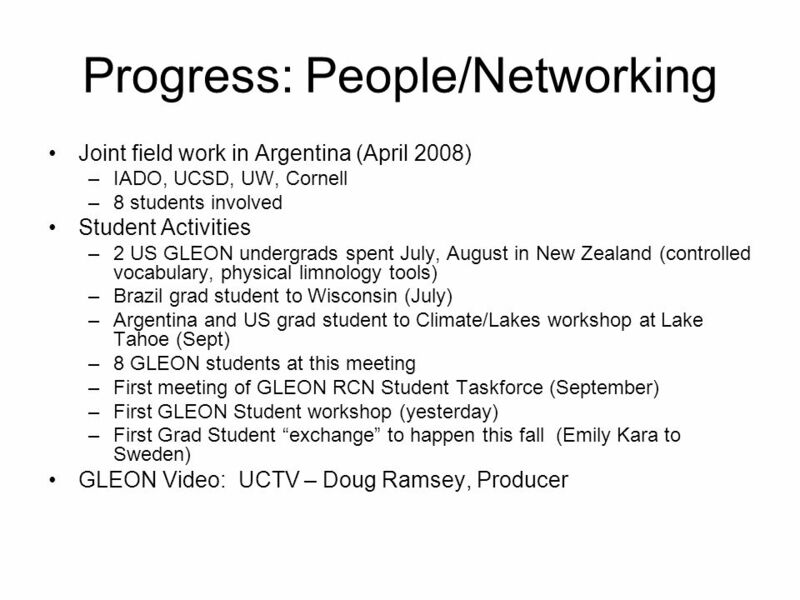 17 Progress: People/Networking (cont.) 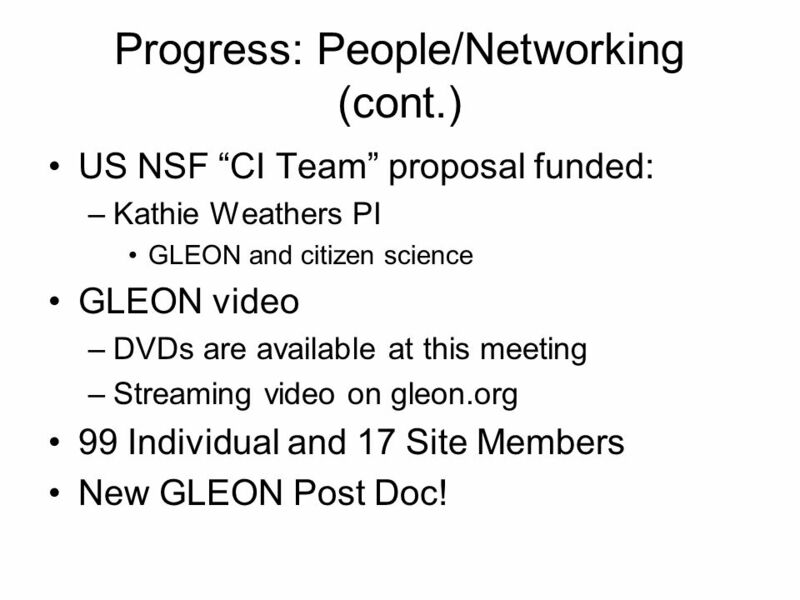 US NSF CI Team proposal funded: –Kathie Weathers PI GLEON and citizen science GLEON video –DVDs are available at this meeting –Streaming video on gleon.org 99 Individual and 17 Site Members New GLEON Post Doc! 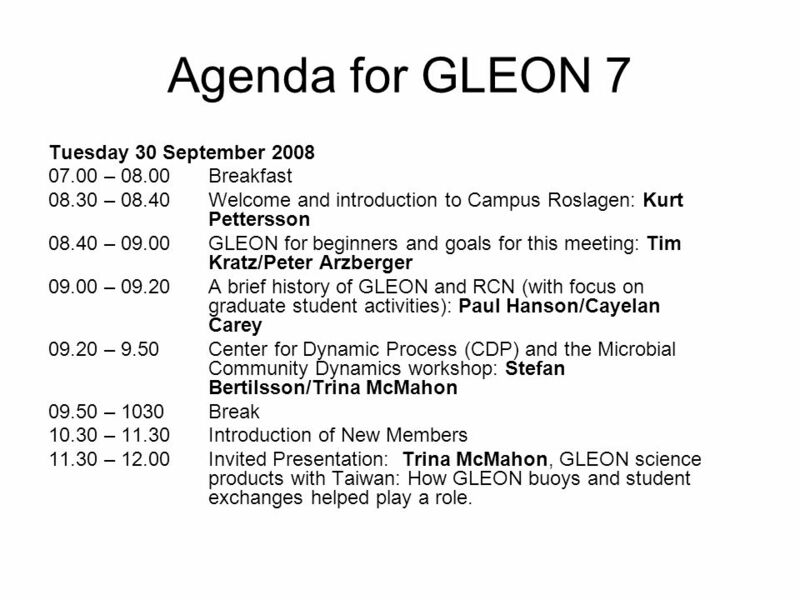 21 Agenda for GLEON 7 Tuesday 30 September 2008 07.00 – 08.00Breakfast 08.30 – 08.40Welcome and introduction to Campus Roslagen: Kurt Pettersson 08.40 – 09.00GLEON for beginners and goals for this meeting: Tim Kratz/Peter Arzberger 09.00 – 09.20A brief history of GLEON and RCN (with focus on graduate student activities): Paul Hanson/Cayelan Carey 09.20 – 9.50Center for Dynamic Process (CDP) and the Microbial Community Dynamics workshop: Stefan Bertilsson/Trina McMahon 09.50 – 1030Break 10.30 – 11.30Introduction of New Members 11.30 – 12.00Invited Presentation: Trina McMahon, GLEON science products with Taiwan: How GLEON buoys and student exchanges helped play a role. 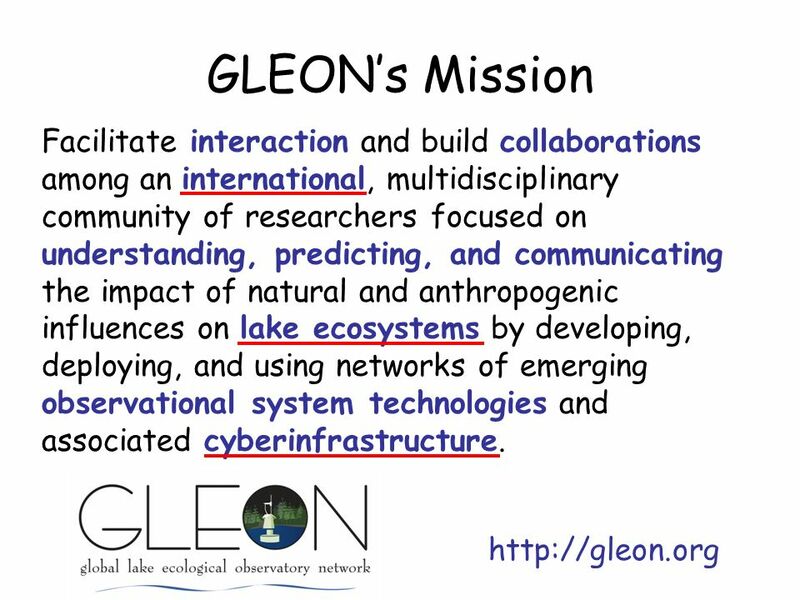 Download ppt "The Global Lake Ecological Observatory Network (GLEON) A grassroots network of –lake scientists, ecologists, engineers, information technology experts." N The New Zealand connection: Rotorua lakes David Hamilton and Chris McBride University of Waikato, New Zealand Location Stream nitrate levels. Lammi Biological Station Prof. Lauri Arvola 4 seniors, 3 post docs, 5 post grads, 3 assistants Research interests Functioning of boreal forest lake ecosystems. 1 N C H C 2007 /09/28 Flood Grids Fang-Pang Lin PRAGMA Institute, NCSA, 28, Sept, 2007. 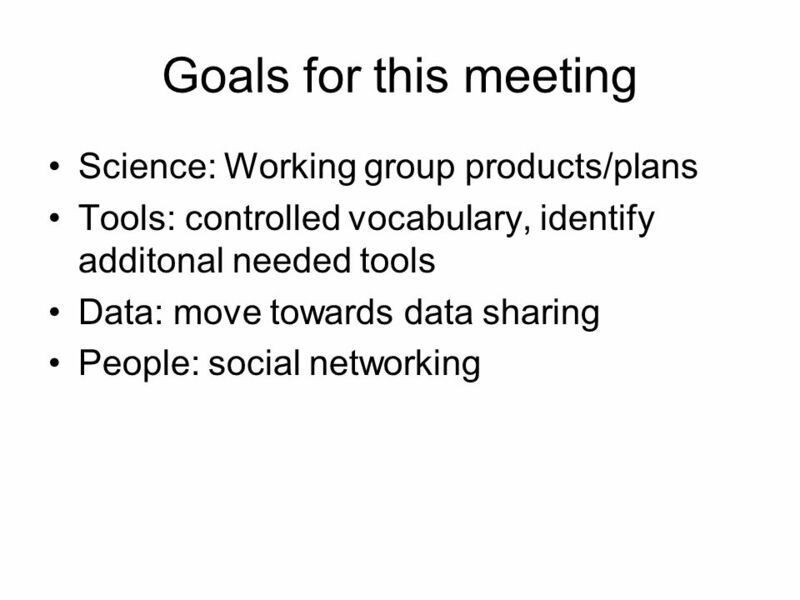 Strengthen Existing and Establish New Collaborations Work with Science Teams to Advance Grid Technologies and Improve the Underlying Infrastructure In. Chapter Overview 15 February 2007 North Star Chapter Program Theme System Engineering Practices in Industry Emphasis - Systems Engineering Interaction. "System Analysis Tools and Techniques: CORE 12 June 2003 North Star Chapter. Governance Why Bother?. 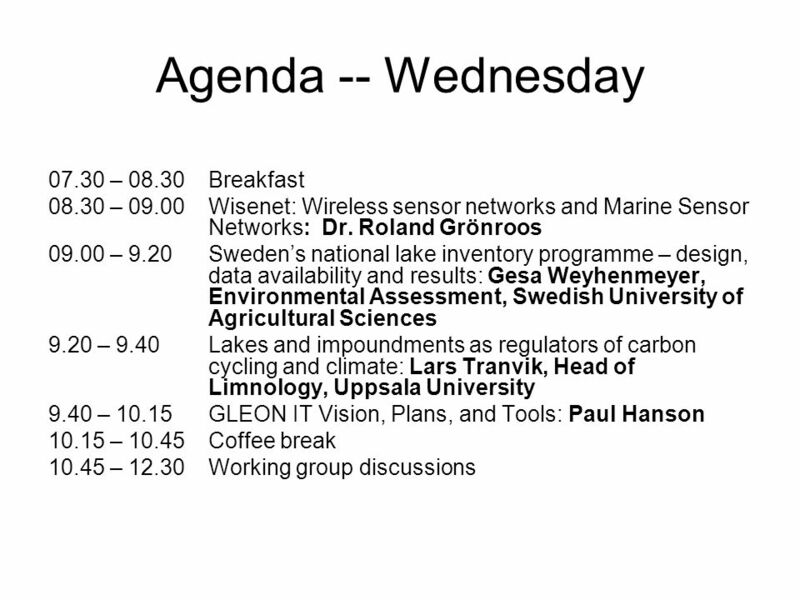 How do we fulfill our vision Vision: –Lakes around the world Equipped with sensors Sending data to each other and the world –Researchers. 99 participants 43 First Time 29 students 36 female, 63 male 6 continents Africa Asia Europe North America Australia/NZ South America Australia Brazil. 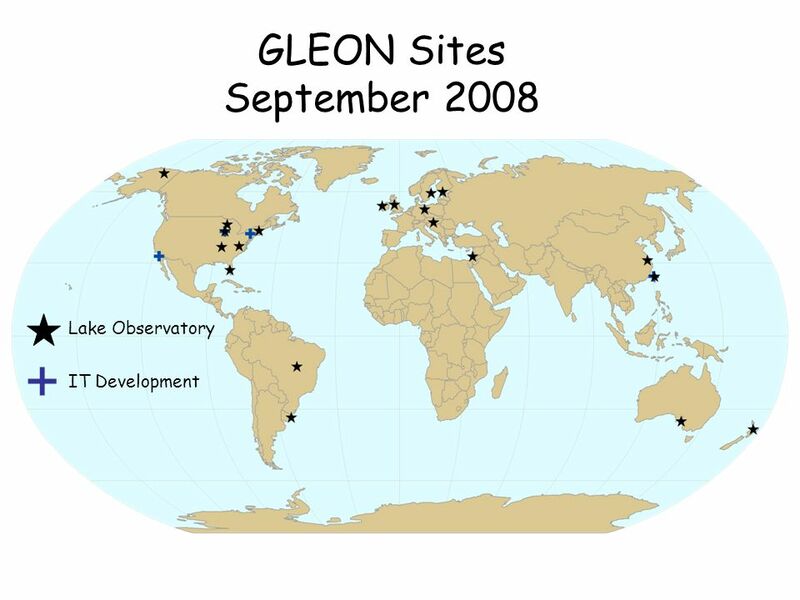 Progress Since Taiwan 2 – 4 October 2006 GLEON 4 2 – 5 March 2007 Lammi Biological Station. 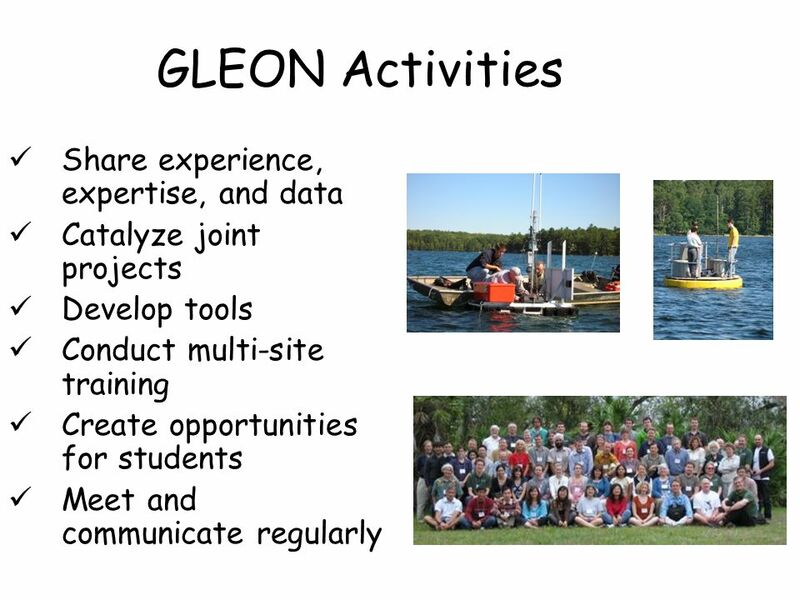 Paul Hanson, Fang-Pang Lin, Miron Livny, Chin Wu, Chris Solomon, Many colleagues of the GLEON Transforming ecological sensor networks from data collectors. 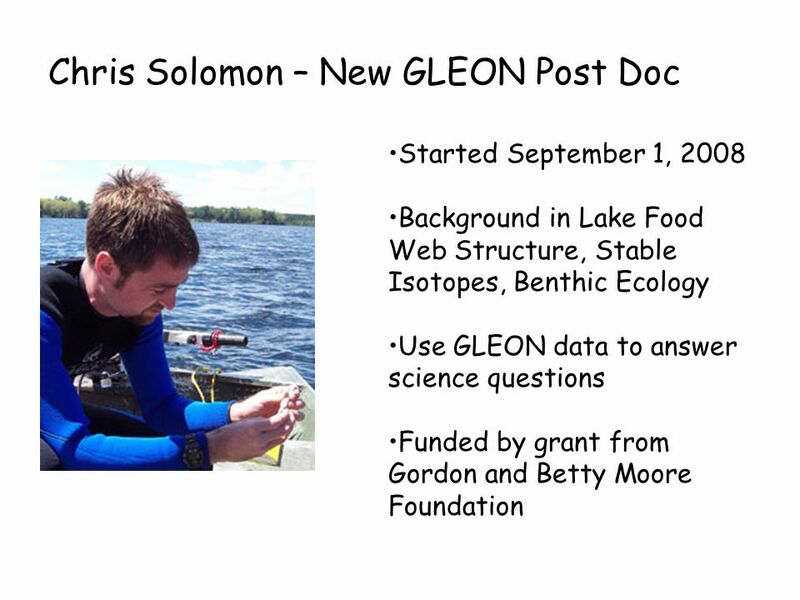 A Short History of GLEON Peter Arzberger University of California-San Diego Tim Kratz University of Wisconsin-Madison. 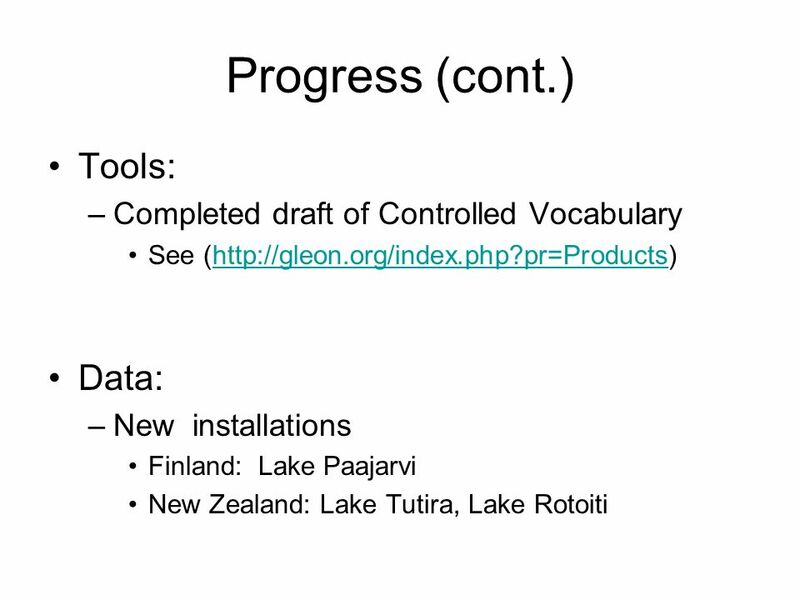 Vega: A Flexible Data Model for Environmental Time Series Data L. A. Winslow, B. J. Benson, K. E. Chiu, P. C. Hanson, T. K. Kratz. 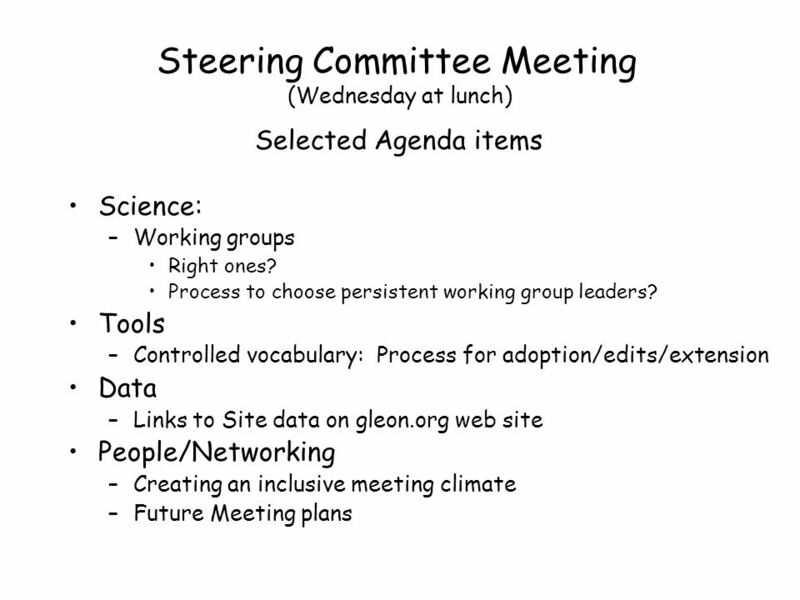 GLEON 8-IT Working Group (ITWG8) Fang-Pang Lin, Feuchtmayr Heidrun Barbara Benson, Hsiu-Mei Chou, Hipsey Matthew, Honti Mark, Nakamura Ryosuke, Solomon. Wouldnt it be cool if…. 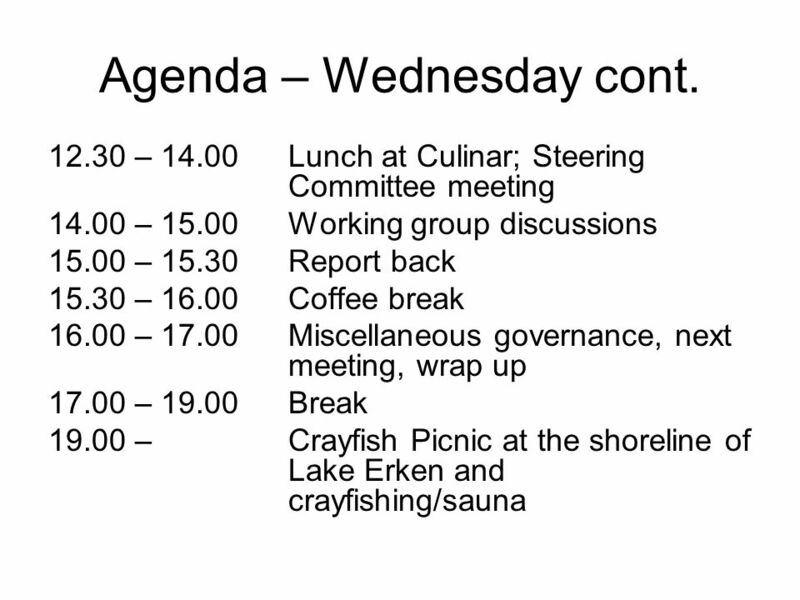 …at the press of a button, we could calculate Wedderburn number and other physical lake characteristics smooth buoy data to specific. 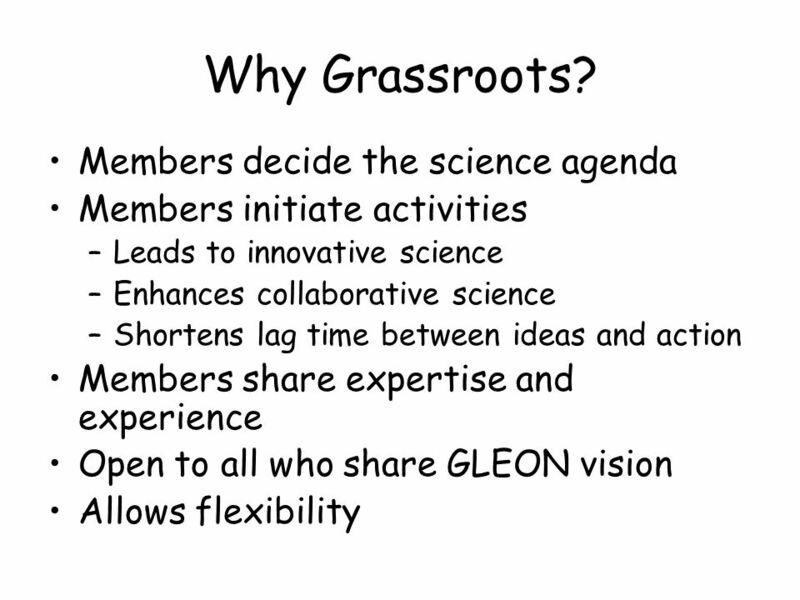 NSF EARS IGERT & GLEON Craig Williamson, Miami University For many others at Kent State & Miami Universities, Ohio, USA.